Hell Bunny is a brand I got introduced to by-where else-Modcloth! They have fun and bright novelty prints and their fashion style ranges from the 1940s-1960s. I believe their prints have something for everyone as they feature a lot of skulls on some of their prints, to which I personally say no thank-you as there's enough death in real life, as well as floral, tropical and bird prints...to which I say yes please! They also have some great circle skirts that come in solid prints-I own two! Let's walk through the pieces I have and I'll explain why Hell Bunny is worth having in your closet. As you can see, this is clearly one of my favorite skirts! What I love most about it is that basically every color seems to go with it! 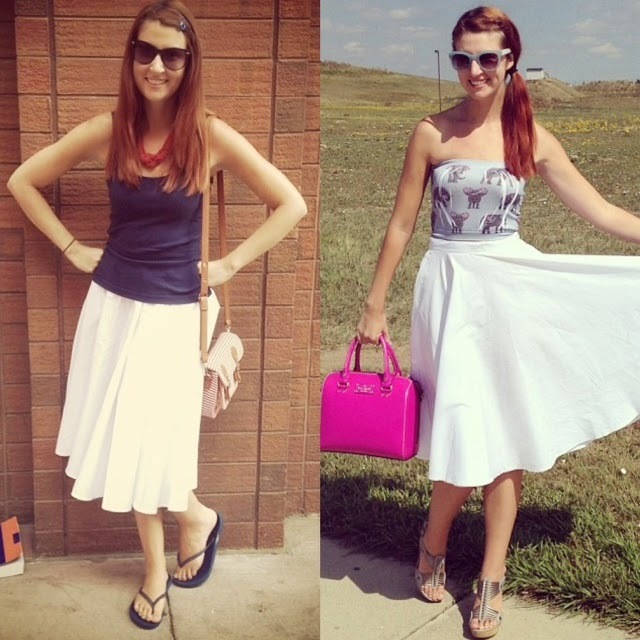 It's always amazing when you love a skirt so much regardless, but it is also super wearable because it can essentially be a different outfit every time you wear it! Also from Hell Bunny: the petticoat I recently purchased and reviewed here. In the above photo you can see that I used my Hell Bunny sunflower skirt with the petticoat for a double Hell Bunny win. This is one of my favorites, but sadly I haven't gotten a chance to wear it a lot. I don't like sleeves-even short sleeves- when it's hot out and Denver is still experiencing Indian summer 80% of the time. As the weather drops I anticipate wearing this dress more. The print is gorgeous, the fabric is soft and silky, and I despite that I'm not much a romantic movie kind of gal, I totally feel like Rachel McAdams in the Notebook in this dress! I also got it for $35 during a HUGE Modcloth sale, which was amazing considering this dress is still relatively newer and going for $70+ on other sites that carry the dress. I spoke of this dress in my Gaga for Flamingos post. I had wanted it for forever and am super glad I finally can call it mine. Despite the summer-y colors and prints to it, I'm excited to wear it in the winter anyway! During a Labor Day sale I got it from Unique Vintage...as well as these next two Hell Bunny items below! This dress is called the Souvenir Dress, and it's the same cut as the above Flamingo print one. I fell in LOVE when I first saw this print because I'm a total sucker for travel dresses, especially in a vintage motif. 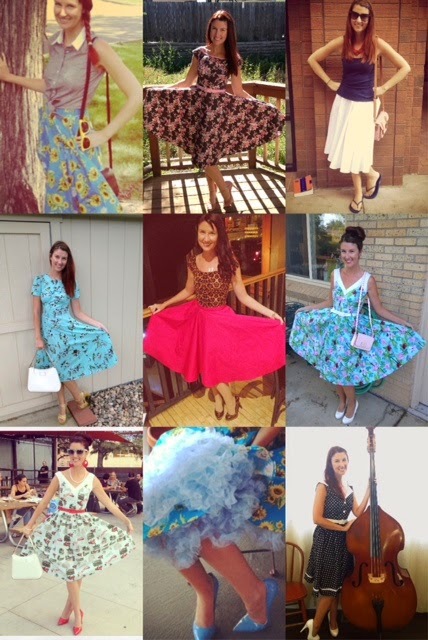 Seriously...name any travel dress out there and I either own it or it's on a wish list of mine! I was also in need of a red circle skirt and with the way the percentages off worked for my Unique Vintage order, I effectively got this skirt for free! Sadly I have yet to get a great photo of it in a better lighting, but so is the case sometimes when you infuse fashion blogging with lifestyle blogging and the seasons change before you realized you needed to charge your point and shoot while out and about for better flash quality! Soon there'll be a better one...I've been itching to wear it again and red is such a great color for all seasons so this skirt is en route to becoming a staple. I am super lucky because in my own hometown there is a store called 13 Vintage that sells a lot of vintage inspired clothing, including Hell Benny items. And of all people, my hard around the edges brother recommended it to me! The second to last time I was there my mom got a blue and white polka dress from Hell Bunny and I got this amazing Rosie dress. I've been putting off wearing it until fall, which is now, so I'm super excited as it's literally the perfect fall dress! The good: The prints are amazing. The quality isn't the highest of top notch, as most items are mainly just cotton material, but considering so many other brands sell cotton dresses for so much more I say for what you're paying for it is great. Occasionally Hell Bunny is more pricey, but it's so easy to find sales on Modcloth, Unique Vintage, eBay, and Amazon that it's easy to not pay top dollar. The bad: Like I said, quality isn't the best fabrics ever...but I'd hardly rank it as bad! The ugly: No ugly...unless you're like me and on the slender side. But even then this is just information you should know before purchasing and not necessarily "ugly". I'm a 25-26 inch waist, so usually I'm a small in skirts. I'm a XS in Hell Bunny skirts with a little bit of room to grow if need be. That's not a complaint, because those high waisted skirts hit you at weird points sometimes and having a little bit of room throughout the day is often a good thing! The dresses I have more issues with though. I'm an XS in both Hell Bunny and other dresses generally, but in the case of the Flamingo, Souvenir, and B&W polka dot dress I'm borderline swimming in the back. I want to shrink them, but am a little afraid of losing their shape so I'm erring with caution with them for now. Plus cardigan and light jacket season is upon us, so there's no rush (but feel free to leave a comment if you have a tip regarding shrinking your clothes but keeping the shape!) Again, none of this is "ugly" but I'm not convinced their sizing is true to form. And I can imagine if an XS runs large, all other subsequent sizes run large too. FYI. Bottom line: I love Hell Bunny. Some of the items I have are amongst my favorite pieces of clothing and I have at least a half a dozen other items on wish lists from HB that I am foaming at the mouth for! Hi, love your Hell Bunny review! I want to do a post soon on my Hell Bunny clothing items! You have such a nice Hell Bunny collection, wow! 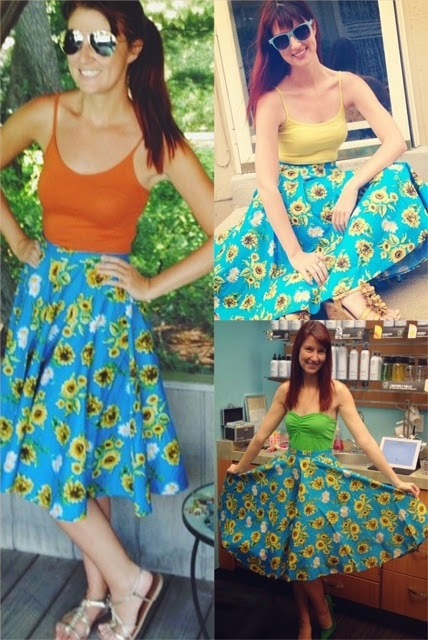 I'm especially jealous of the sunflower skirt, ha. Hopefully I can find it online some day! And the black dress with white polka dots- I have that in red & love it sooo much :) Hell Bunny is such a great brand!! And reasonably priced, which is awesome. Have a great weekend, pretty lady!